Have you ever come across an article, video or piece of content that actually helped you do something? Whether it was a Tripadvisor review that guided you to a good restaurant, practical tips for buying a house, or a YouTube video that showed you how to unblock a drain pipe. We all have moments where we need practical, reliable information to solve an issue, answer a question or show us how to do something. But with so much information available at our fingertips, how do we sort the good from the bad and ugly? From a business perspective, every company is jumping on the content marketing bandwagon, so what makes good content really stand out? If you own or run a company or are responsible for creating content, you need to consider whether it’s original, useful and engaging. Does it actually serve a purpose and give enough reliable information to the reader? In our recent article Top Tips for Creating an Effective Content Marketing Strategy, we explained the business benefits of content marketing and how to get started with a strategy. We gave tips on how to set content marketing objectives, and touched on how to generate new content ideas. As we’ve covered the basics of content marketing best practices, we’re now going to show you some examples of how well-known brands are creating content. We’ll arm you with practical tips to not only get the creative juices flowing, but to help steer your content marketing blueprint in the right direction to hit that all-important sweet spot. When reading through these content marketing examples, think about what you can learn from these companies. Are there any tactics you could use for your own business? Whether it’s user-generated content, engaging images or downloadable guides, if it meets your objectives then why not build it into your content strategy? The first example we’ve picked is from Airbnb, an online community where people can book accommodation in locations across the world, ranging from flats and houses to lighthouses, treehouses and even shepherds huts. The guides have real content from real people who’ve stayed there, curated in a section called ‘the community says’. They also have a ‘Locals love’ and ‘Locals complain about’ to give a genuine feel for why people love or hate the place. People are more likely to trust content from real people than a company who just says ‘it’s great, you should go there’. The guides are also equipped with practical advice and information, including travel times to key sights and attractions, maps, advice on the best way to get around, links to featured articles, and a sentence to sum up each neighbourhood. Take a look at the screenshot below. All of this is helpful content which earns brownie points with users and builds brand credibility. 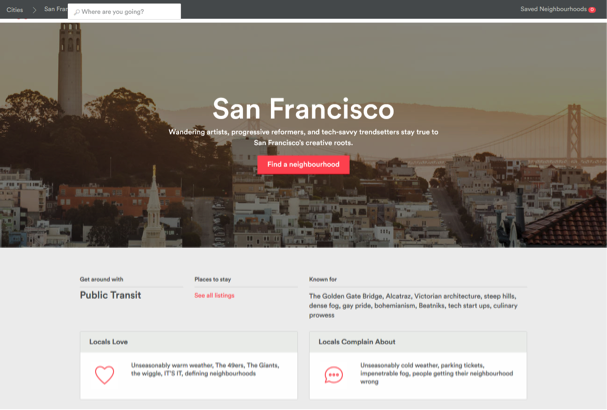 Overall, the Airbnb neighbourhood guides are a good example of successful content marketing. Our only suggestion would be to have guides for more cities! It might also be useful to have a link to the ‘street view’ version of the maps. However, there’s lots you can apply to your own strategy (if it’s right for your objectives and audience). Perhaps you have a bank of images you’re not making the most of? Or maybe you have user generated content you could use to your advantage? The guides are genuinely useful and help to build trust in the brand, which is often tricky in the financial services sector. Barclays have clearly invested time in researching their target audience and finding out what would be useful to them. They use original content to engage their audience by actually being helpful. Gold star for Barclays. What’s also great is that there are clear links at the bottom of each page showing the user they can download the guides (see below). Once downloaded, they can be used to carry out a meaningful task, like writing a business plan. Their guides are based around things that every business owner needs to do, and Barclays is giving them a helping hand to get these things done. What’s also great is that Barclays are using their Business section to generate interest in free seminars and workshops (see below). They’re taking the content offline and encouraging their audience to engage with them elsewhere. Genuinely helpful. The guides are a great example of how to provide original and useful content, and widen the scope to offline content like events and seminars. Barclays could build on this by increasing the variety of content, and focusing on some of the problems that new businesses may face, along with user generated content about how to tackle these issues. Are there any ideas you could use for your own business? Perhaps downloadable guides or whitepapers, or a way to drive leads for events? Now onto our third example of content marketing and what can we say, Virgin America have definitely gone down the ‘original’ route with their all-encompassing BLAH Airlines campaign. It consists of a 6 hour advert (yes, 6 hours), and online profiles for a fictional company called BLAH Airlines. Designed to be a mockery of bad airlines, it’s almost as off the wall as a gorilla playing the drums, and certainly ticks the ‘original’ and ‘engaging’ boxes. By being so original it draws attention and gets people talking about the brand. They even set up Twitter and Instagram accounts for BLAH Airlines, making a mockery of how not to run a Twitter account. The Twitter account (see below) generated over 1000 followers so it clearly provoked interest. It’s genuinely amusing, even the website with areas under construction, vague content and a link to their fax number. It’s so original that it’s hard to suggest specific improvements. Virgin certainly had guts to run a campaign like this. A big brand with a big budget can afford to take such risks, whereas for smaller companies it could take too much time and eat up too much content budget. Would your target audience engage with a campaign like this? Seeing how other companies do content marketing certainly brings different ideas to the table for your own content strategy. In terms of what makes content stand out, original, useful and engaging content really is worth the time and effort. When you know your target audience’s interests, concerns and motivations, it gives you an understanding of what they will find engaging and useful. Don’t forget that it’s not just written words that deliver impact, but images, curated content, videos, guides, social media – the list goes on. It all helps to engage your audience and build trust in your brand. If you need help producing great content, just get in touch with the Transcend team on 01202 313195 or email hello@transcend-marketing.co.uk. We can even arrange a free digital health check for your business!